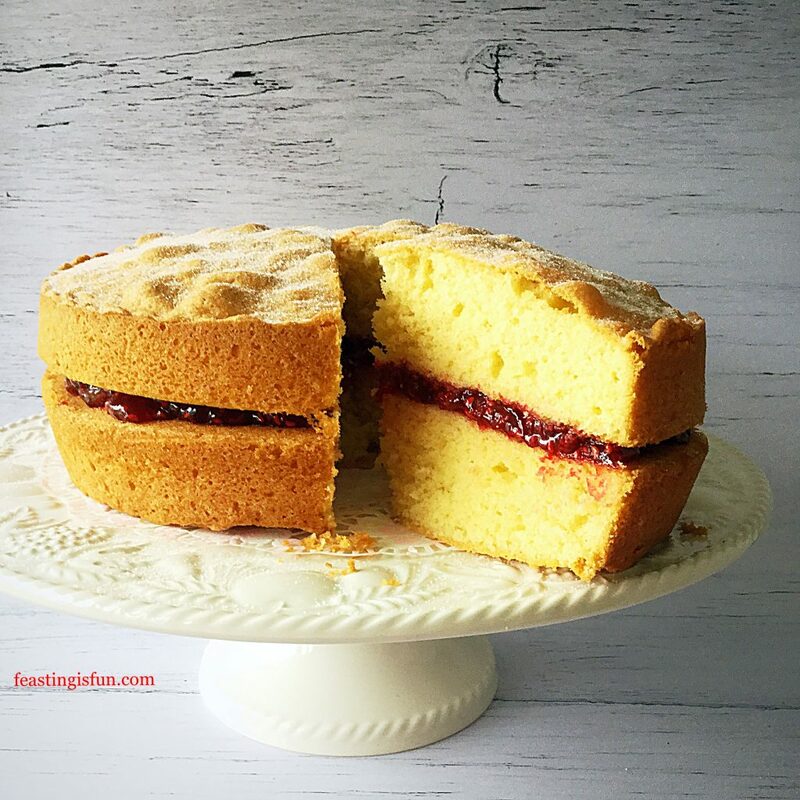 Victoria Sponge Cake, light, buttery, golden sponges sandwiched together with homemade raspberry jam. 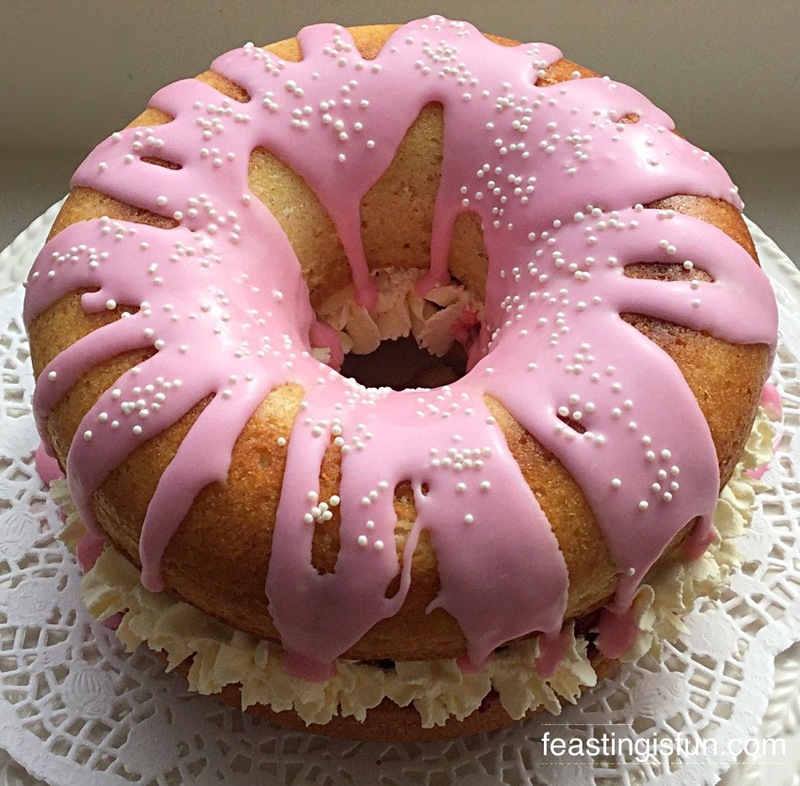 A simple recipe that yields a completely knockout cake both in flavour and looks. Master this recipe and you will forever be asked to “bring THAT cake” when gathering with friends and family. Put simply, this is a cake for feasting. Victoria Sponge Cake sandwiched together with freshly made raspberry jam. 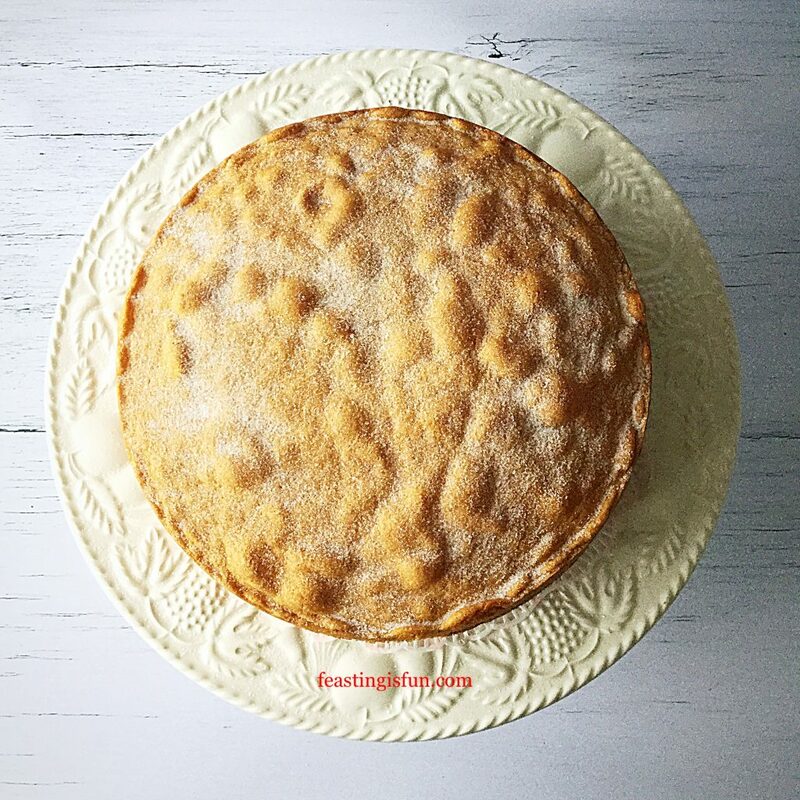 Since a Victoria Sponge Cake is two identical sponge cakes put together with a slather of jam in the middle, it is a great starting point for any baking journey. 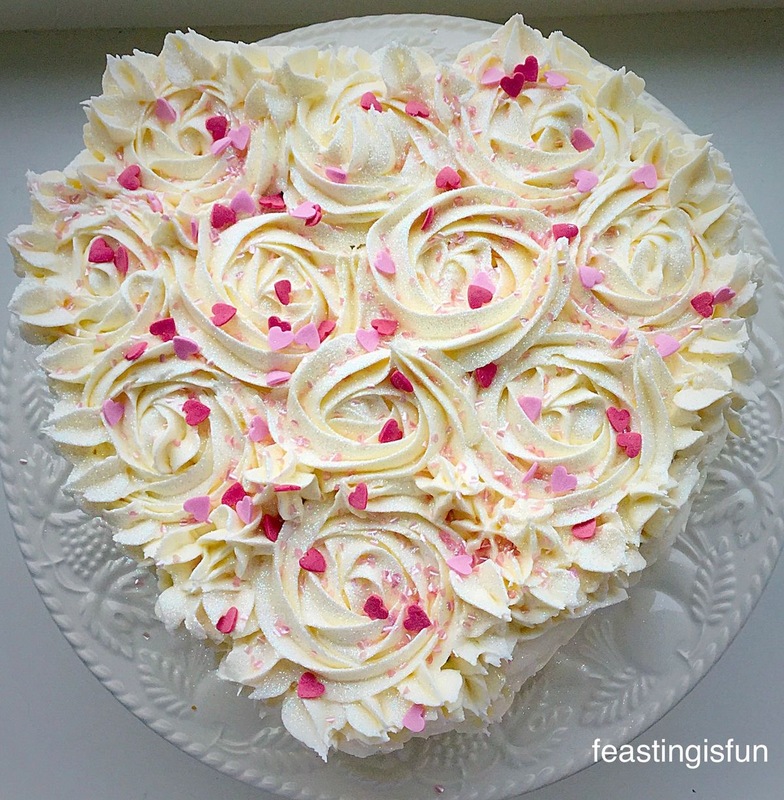 Because there are no complicated decorating techniques, or steps in the method, the finished cake is all about two things. First of all taste; good quality ingredients are key, butter should not be substituted with margarine. Also, texture; a light sponge is a direct result of not over mixing the cake batter. 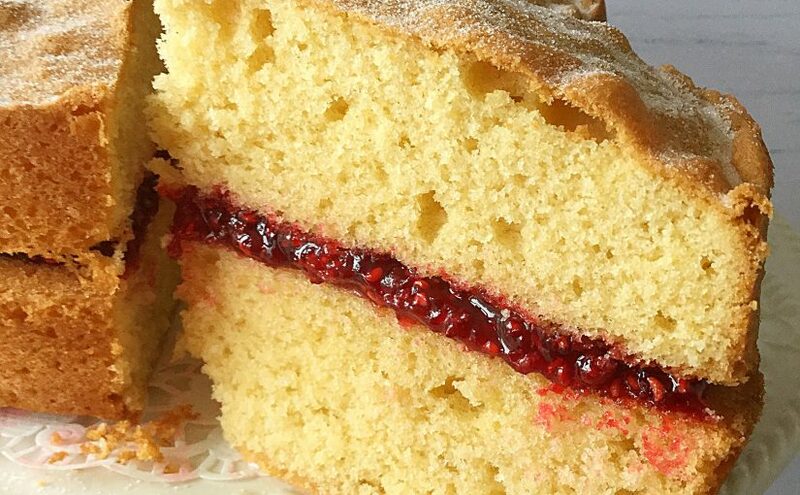 Raspberry jam lends a sweet, slightly tart, intense fruit flavour against the buttery, vanilla sponge. While a good quality bought jam is fine to use, making fresh jam adds an additional edge. Since it requires very little time to make I really urge you to try it. Finally, with a light touch and using great quality ingredients the finished result is the Queen of all cakes. I say Queen as this cake is named after Queen Victoria herself. Victoria Sponge Cake dusted with caster sugar. 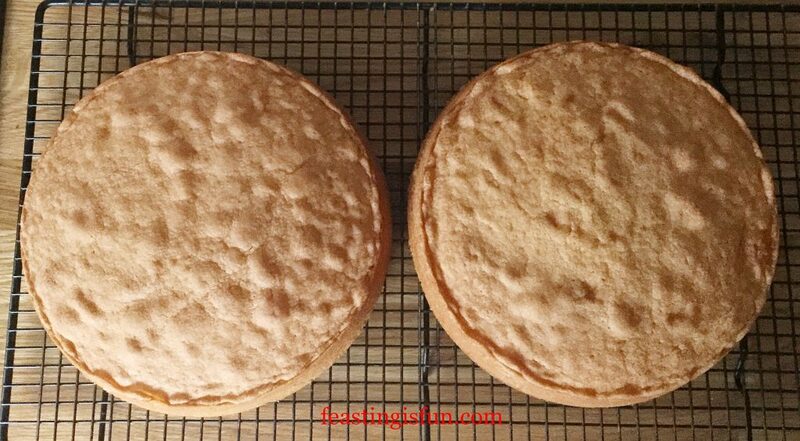 2 x 20cm (8in) greased loose bottom cake tins, the base of each lined with baking parchment. First of all thoroughly grease with butter, both cake tins and line the base with baking parchment. Place the sugar, butter and salt into a large bowl. 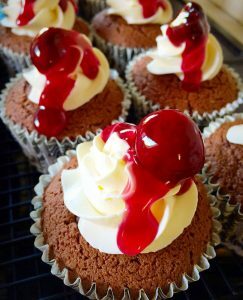 Whisk the ingredients together until pale and fluffy – if using a stand mixer use the paddle attachment. Rub a little of the mixture between your fore finger and thumb. If no grittiness is felt the sugar is well mixed into the butter. Next add the eggs and vanilla extract. Add 1 tablespoon of the flour and whisk together for 30 seconds to combine. Sift the flour (and baking powder if required) into the bowl. Whisk the ingredients together until just combined. 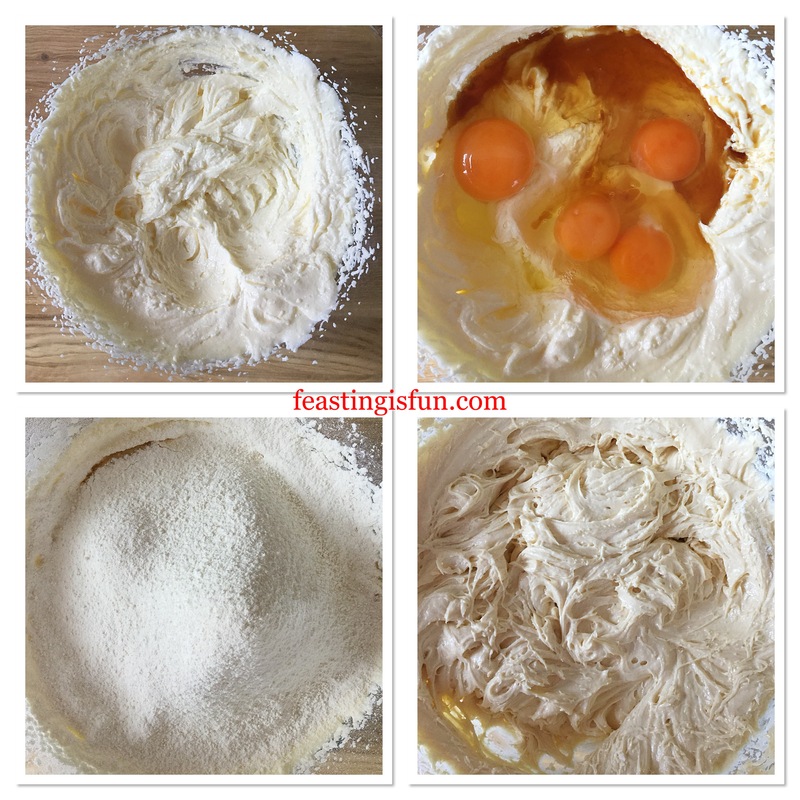 Over whisking, or beating will develop the flour’s gluten, resulting in a tough, baked cake. 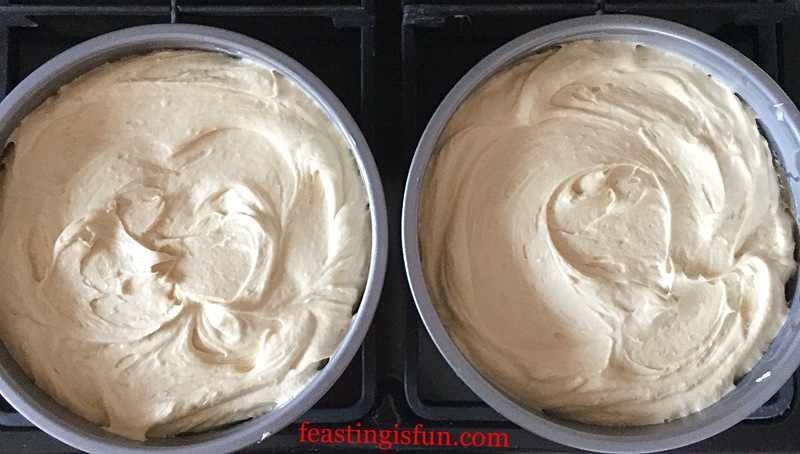 Spoon the cake batter into the prepared tins, dividing evenly between the two. If wanted weigh equal quantities of cake batter into the tins. Smooth the top of the batter with a spoon. Prepared cake batter in the tins, ready to be baked. Place the tins into the centre of the oven (centre and lower shelf if they cannot fit on one shelf). Bake for 35-45 minutes until golden in colour. The cakes are baked when the top springs back when lightly pressed. As soon as the cakes are baked remove from the oven and place the tins on a cooling rack. Allow each cake to cool in the tin for 15 minutesbefore turning out, top of the cake uppermost and placing directly on to a cooling rack. 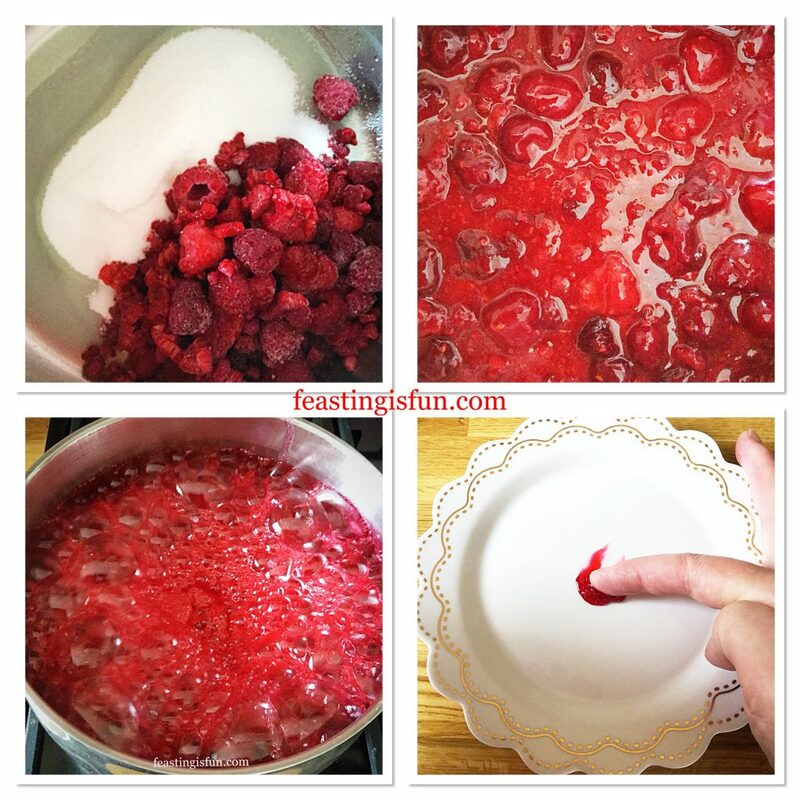 Into a large, heavy bottomed saucepan add the lemon juice, raspberries and sugar. Also place 2 small plates or saucers into the fridge to chill. Stir the ingredients together with a wooden spoon and bring up to a simmer on a low heat. As soon as the sugar is dissolved increase the heat to bring the jam up to a rolling boil – bubbling vigorously but not over the sides of the pan. Stir to ensure the jam does not stick. Take care as the jam will be very HOT. After 5 minutes at a rolling boil spoon a few drops of hot jam on to one of the chilled plates. Allow to cool for a minute. Using your finger, push one side of the jam, if it wrinkles up the jam is ready; it has reached setting point. Should the jam not wrinkle continue cooking for a further 2 minutes and test again. Freshly made Raspberry Jam for the Victoria Sponge Cake. As soon as the jam has reached setting point remove the pan from the heat. 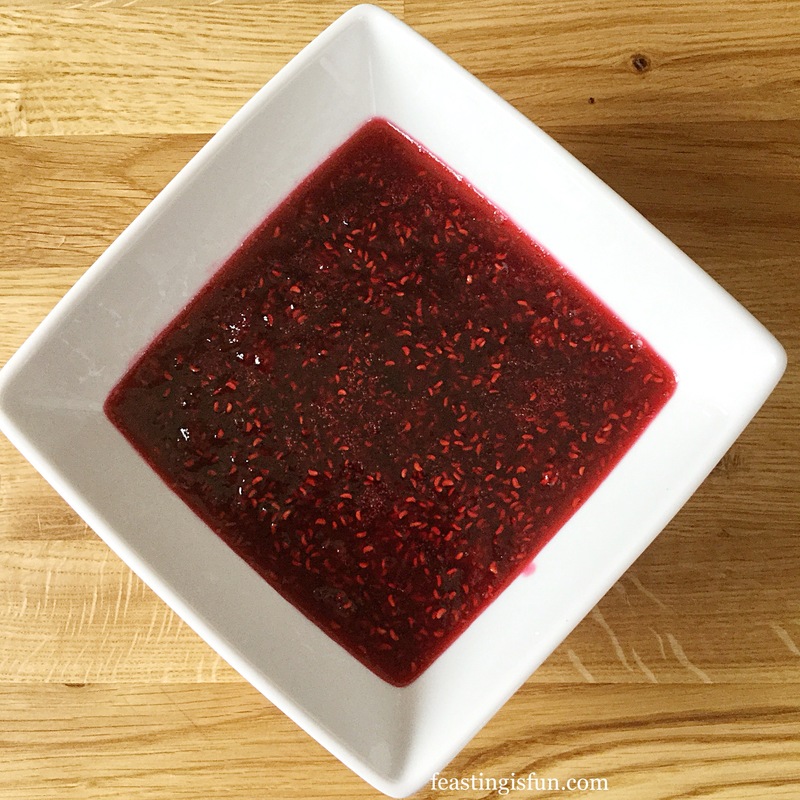 Pour the very hot jam into a heatproof bowl and set aside to cool. 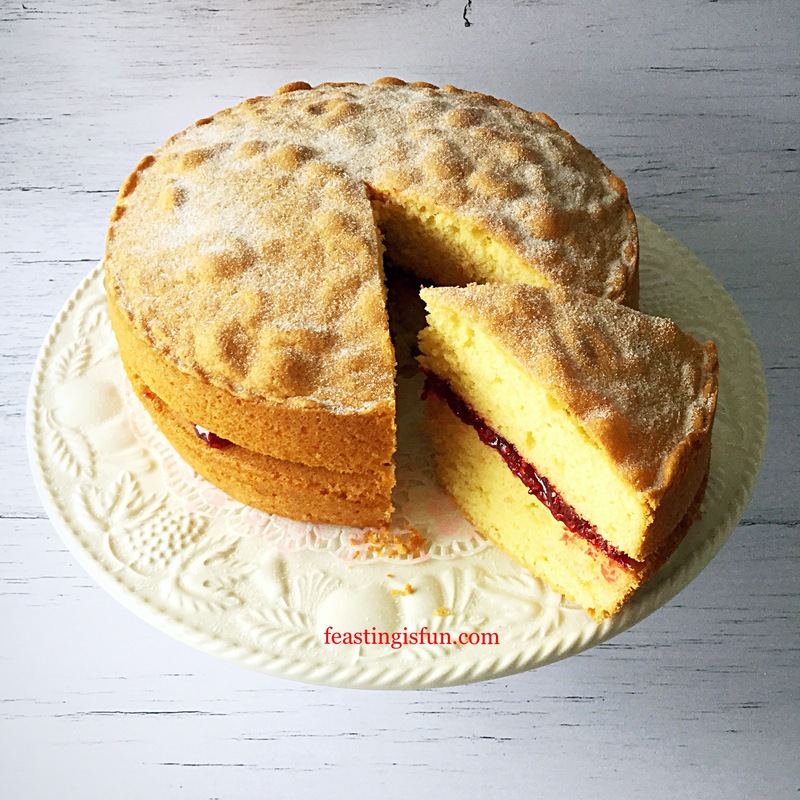 To assemble the Victoria Sponge Cake ensure both sponges and the raspberry jam are cold. Carefully peel the baking parchment away from both sponges. Place a sponge, flat side up on to a plate or board. Spoon all of the jam on to the flat sponge and spread almost to the edge. Also, add a layer of whipped cream if desired. Place the second sponge, flat side down, on top of the jam covered bottom sponge. Finish with a light dusting of caster sugar on the top of the cake. 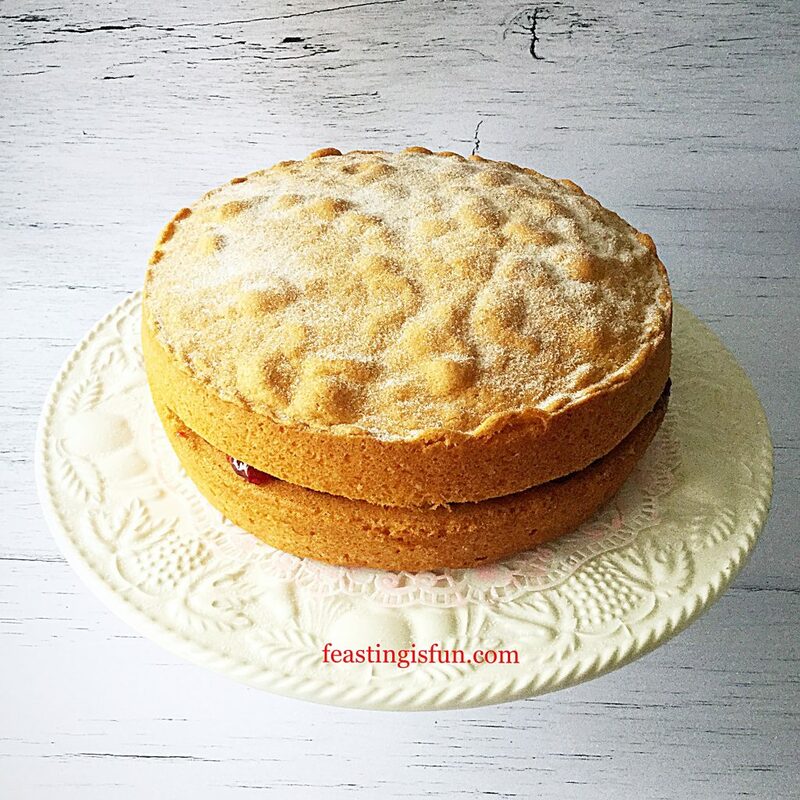 Victoria Sponge Cake with fresh raspberry jam filling. Serve this cake sliced with a good quality, fresh made cup of tea. Alternatively a glass of champagne for a special occasion compliments both the event and cake. 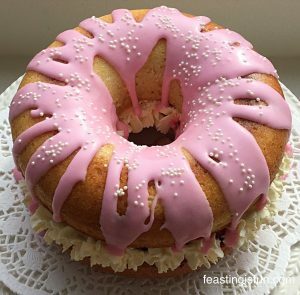 Raspberry and Cream Giant Doughnut. Learning to master a simple recipe and make it well is the foundation to becoming a great cook and baker. 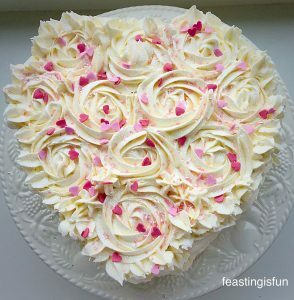 Since cake decorating and presentation are of no importance if the product being served and shared does not taste appealing. Flavour always comes first in any feast. Never more so than when the feast is marking a special occasion. Friends and family bring out the flavour even further, as my long held belief shows that food shared always tastes better.